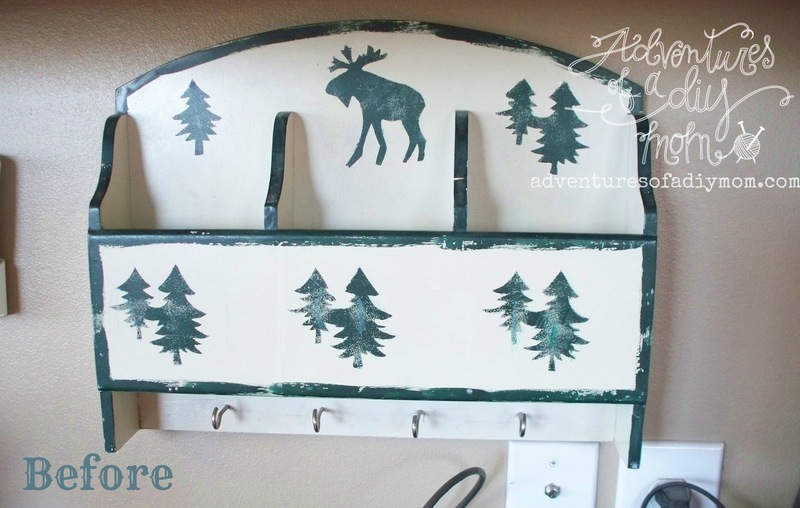 Ever since I made my DIY Menuboard, I was looking for something else to paint in my kitchen. I also wanted to try a technique I'd heard about. You see, whenever I use sandpaper to distress my projects, I seem to sand off more than just the top layer. Sometimes that's ok to see a little bit of wood underneath. But this project the original paint did not match the new paint at all. I definitely did not want to sand through the top layers of paint. I've had this mail organizer forEVER. Remember when moose were really in? Or was it just me trying to find decor to go with all the taxidermy my husband keeps bringing home? I began by spray painting the whole thing black. This was the color I wanted to show up after distressing. The trick to this method is petroleum jelly. more commonly known as Vaseline. Using your finger, rub a very small amount of vaseline over all the places where you want to distress. I went over the edges. Then I hit a few spots in the middle. Now spray paint your top color on top and let it dry completely. The paint will bubble up a little where you've added the vaseline. You can kind of see it where the arrow is pointing. Now I literally grabbed a paper towel and gently rubbed over where I had put the vaseline. 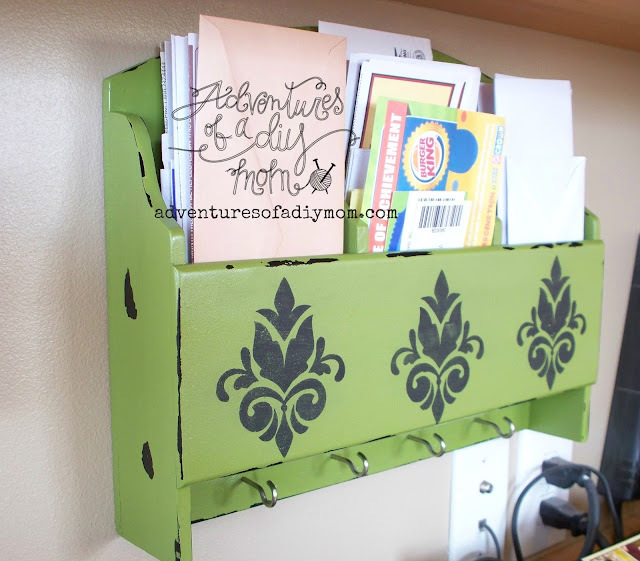 The green paint came up like magic leaving it distressed with hardly any work at all. This was so easy and I love the chippy look. I'll definitely be using this method again. I decided that it needed a something more. So I decided to stencil. You may remember this stencil - I've used it on my game cabinet and my bench/chest. Here it is back in use. In the interest of keeping it real I'll give you a look from a distance. This is the junk spot. I try to keep up with it, but with the kids home all day long - there seem to be a lot of messes to clean up. Much better! Now if only it will stay that way. Looks so good! 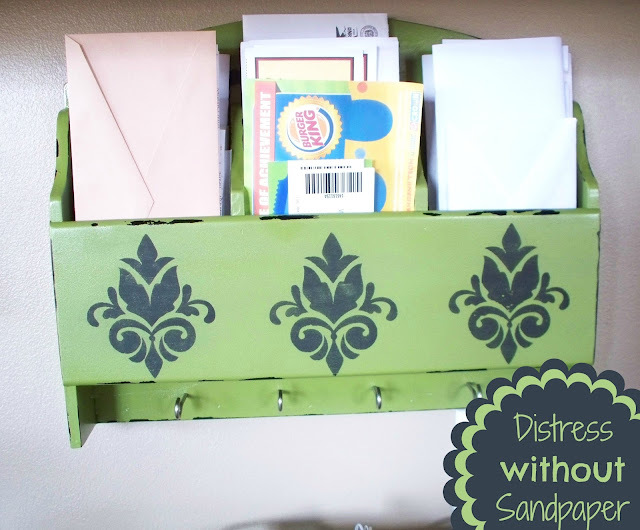 I like the idea of distressing without sandpaper! What a great idea! Found you on You're Gonna Love It at Kathe with an E's. I love to use Vaseline when painting. Your piece turned out great. Your project looks wonderful. 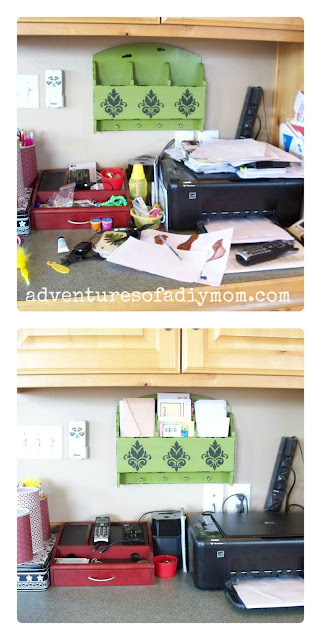 I'm going to try this on a box I am up-cycling. Thanks for sharing.